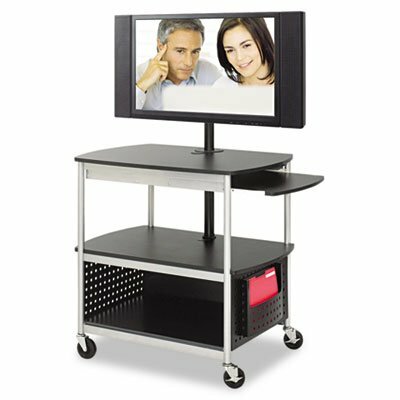 Scoot Multimedia 68"H Cart is an economical way to move your flat-panel monitor and other equipment safely and securely. Post height adjusts in 1 1/2" increments in 7 1/2" range and holds up to 42" monitors or 80 lbs. Features a detachable, height adjustable file pocket. Includes UL approved electrical assembly with surge protector. Steel frame construction with durable powder coat finish, mobile on four casters, two locking. Complements Safco Products entire line of Scoot products..
Scoot flat panel multimedia cart holds monitors up to 42" or 80 lbs. Complements Safco Products entire line of Scoot products.